Summer stripe tote bag. Look both elegant and fashionable when setting off to the beach, heading to the shops or meeting the ladies for coffee. This bag will cater for all occasions. The classic cabana stripe is bold in navy and white, compliments a vertical and horizontal pattern. 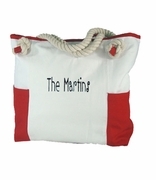 Covered rope leather stitched handles and accent trim add a classy finish and extra durability. This bag will move seamlessly from spring into summer and will be a favorite all year round companion. 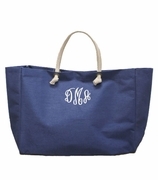 Monogram personalization included with purchase. Stripe summer tote bag in a cotton canvas measures 12"W x 18"H x 7" across bottom. Lined with interior wall pocket. Snap closure.